Robert Dudley was the 17th century author of Dell’Arcano del Mare. This huge maritime encyclopedia covers all aspects of maritime life including shipbuilding, astronomy and navigation. It also contains 130 beautiful maritime charts covering all parts of the world. 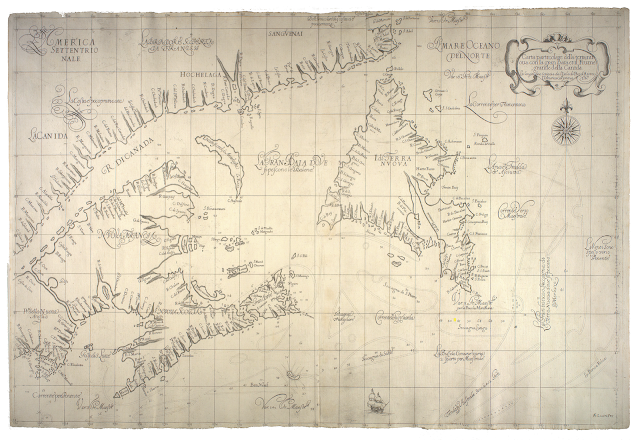 One of the 130 maps in his Secrets of the Sea is the Carta Particolare della Terra Nuoua con la Gran Baia et el Fiume Grande Della Canida, a sea chart of the Newfoundland era. Norfish has created an interesting story map which explores some of the more interesting details in Robert Dudley's sea chart of Newfoundland. As you progress through the story map Norfish examines the map's projection, calligraphy, place-name labels, prevailing winds and fathom soundings. You can also explore the map for yourself. Robert Dudley's sea charts are completely unique, enjoying a distinctive technical style with beautiful calligraphy and elaborate compass roses and cartouches.